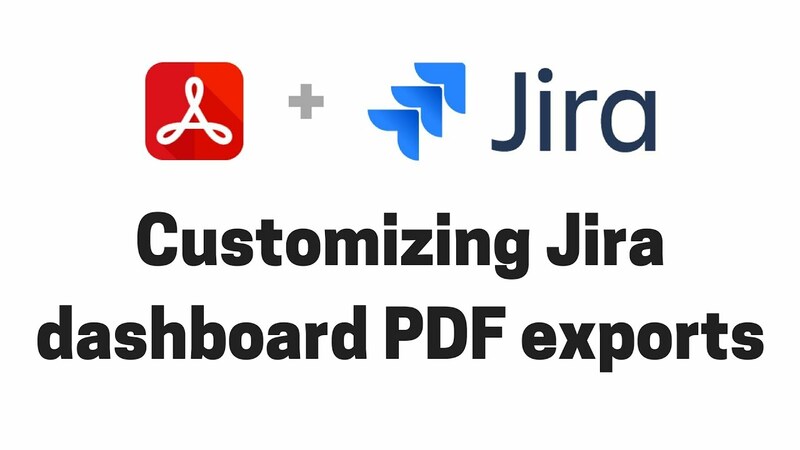 How to export Jira dashboards to PDF? How are unsupported gadgets exported? How can I find out the ID of a dashboard? How can I find out the ID of a gadget? Jira dashboards are great tools to summarize information in a single screen composed of little configurable boxes, the so-called gadgets. A gadget can contain a list of issues, a graphical chart, an activity stream, or some other type of key data in a quick-to-understand format. Dashboards are, however, not suitable for sharing with others outside the Jira web interface. They cannot be exported to document files (like Word or PDF), they are difficult to print in good quality (browsers have difficulties with layouting the dashboard page to printed pages), and exporting them to image files has numerous drawbacks, as well (text cannot be copied after being converted to pixel data, links not working any longer, etc.). 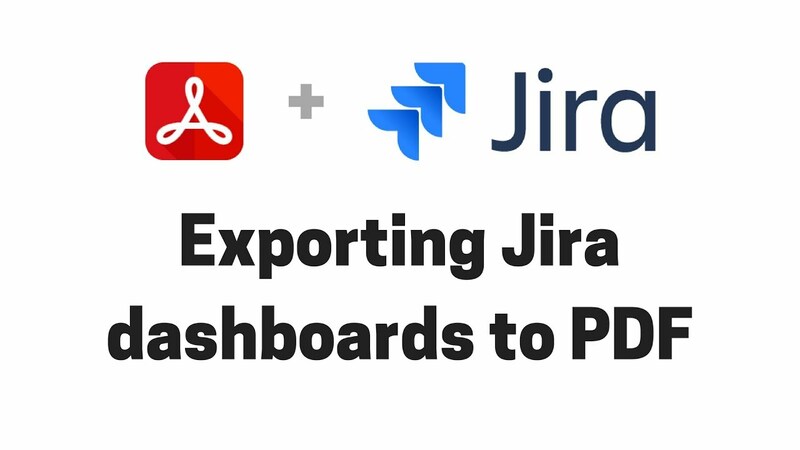 This article describes a powerful method to export Jira dashboards to PDF documents using the Better PDF Exporter for Jira. The resulted PDF files can be shared, emailed, archived, printed or even further edited, just like any other electronic business document. They are also highly customizable: not only you can show or hide certain gadgets, add your company branding (logo and colors), or change the layout, you can also mix Jira gadgets with any other type of information within the same PDF. An additional very frequent use case you can solve with this approach is exporting Jira reports. How? Most of the Jira reports have an equivalent gadget. For example, the Created vs Resolved Issues Report shows you the trend of issue creations and resolutions in a graphical chart and an additional data table. You can get the same result by adding a similarly configured Created vs. Resolved Gadget to a dashboard. By default, this will be exported as the chart only, but you can enable the export for the data table, too. After installing the Better PDF Exporter app, there are two ways to export dashboards that are explained in the next sections. To create a export immediately, just open the Tools drop-down in the top-right corner of a dashboard and click the "Export Dashboard to PDF" link as shown in the screenshot above. In many situations, you want to export the dashboards automatically (without manual actions) and email, save the exported PDF documents, or attach those to Jira issues. It is possible to start automations either in regular intervals (ex: every weekday morning 8:00AM) or when some event happens (ex: a new critical-priority bug is created). Better PDF Exporter offers powerful automation for any type of PDF exports, also including the Jira dashboard exports. Automation rules are explained in details in the PDF automation tutorial. Follow the guides in that article with one important distinction: when you configure the automation action, enter the dashboard ID to the Title field! Why? Under the hood, the default dashboard PDF template (dashboard-fo.vm) will check if the dashboard ID is available as HTTP request parameter and use that (for web-based exports). If that is not available, it will use the ID provided in the $title parameter (for automations). In both cases, it will "just work". Another difference from manual exports is that automated exports render the PDF templates directly, not via PDF views. As there is no PDF view involved in the process, its name cannot determine the layout (number of columns) for automated dashboard exports, which is the default behaviour for manual exports. It means that automated exports will use the default 1-column layout, unless you re-configure that in the dashboard-fo.vm template. You can also decide to make a copy of dashboard-fo.vm as dashboard-automated-fo.vm, use a different layout in the latter, and configure all automation actions to render this specialized version. The app does not support all gadget types: there are many types with very different implementation details, that require major efforts to implement in PDF. Our primary goal is to support the most important gadgets that would be primary candidates for exporting. These include the report type gadgets (like Filter Results Gadget), while exclude the conveniece ones (like Quick Links Gadget). In many cases, an unsupported gadget type can be effectively replaced with a supported, more general type. In fact, the replacement can easily be more powerful than the original one! In Progress Gadget: display a JQL query like status = "In Progress"
The default behaviour in the dashboard-fo.vm template is that a small block with a warning text will be exported. That block will contain a convenient link to ask for the support of the missing gadget. The dashboard exports are rendered from the factory-default PDF template dashboard-fo.vm, by merging that with gadget data to produce the final output. To modify the content (e.g. hiding certain gadgets), to modify the layout (e.g. using two columns instead of one), to set image resolution for charts, you have to edit the values of configuration values in the top of dashboard-fo.vm. To make more drastical changes, like implementing a custom layout or a new document type, you have to edit the template body (after possibly making a copy of the original dashboard-fo.vm). For general information on template customization, see this page, while the next section discusses the dashboard-specific customizations. When you export a simple 1-column dashboard, a plain vanilla 1-column "A4 portrait" PDF is fine (i.e. the gadgets strecth to the whole paper width). When you export a regular 2-column dashboard, you probably want to get a 2-column "A4 landscape" PDF. When you export a complex 3-column dashboard, you probably want to get a 3-column "A3 landscape" PDF. If there are more columns in the PDF than in the web, then the "extra" PDF columns will be simply left blank. ## override the number of columns with N if view name contains "(N columns)"
## a new value parsed from the view name is assigned to "columns"
Create a new PDF view with a name that contains "(N columns)" or rename an existing PDF view to a name that contains this string. If you want to specify the column count in the template, not in the view name, then assign a value to $columns in the template (and make sure that the PDF view's name does not contain "(N columns)"). If you need different column counts in different situations, create multiple copies of dashboard-fo.vm with different $columns value in each and use separate PDF views to render those templates. Although using an N-column layout (as explained above) is perfect in most cases, you can also decide to implement your own custom layout. For example, in a branded report you can display your company name and logo in the top, then some full-width introductory text, then two gadgets in a 2-column section, then some full-width static text, then some other gadgets in a 3-column section, etc. If you want to hardwire the gadget IDs to your template (making that a static template in some sense), then use tables and blocks to define the layout and render the gadgets by passing their IDs. If you want more dynamic behaviour, then get the list of the gadget IDs in a dashboard with $gadget.getGadgetIdsByDashboard("10100"), process those if necessary, then use tables and blocks to define the layout and render each gadget where you want it. Again, you can rewrite this to your preferences (by modifying the existing rules or adding new ones). Setting this to false will result in transparent (white) gadget headers, which make the document "more airy" (no big blocks with dark colors) and can also save ink. Depending on your requirements, you may want to show or hide the data tables of chart gadgets. Jira dashboards typically hide them, while Jira reports having more screen space do display these. Your primary helper when working with gadgets is the Velocity tool called $gadget. $gadget.getDashboardIds() Returns the list of all dashboard IDs that are visible for the current user. $gadget.getGadgetIdsByDashboard("10100") Returns the list of all gadget IDs in the dashboard with the ID = 10100. It is returned in "visual" order (top to bottom within column, left to right among columns). $gadget.getSortedGadgetIdsByDashboard("10100", 2) (since 6.0.1) Returns a "2D collection" of the gadget IDs in the dashboard with the ID=10100, laid out for a 2-column layout. In the return value, the outer list contains the columns (left to right), while inner lists contain the gadget IDs within the column (top to bottom). The layout algoritm in the PDF follows the web layout of the dashboard as much as possible. If the PDF has equal or more columns than the web, then the web layout is 100% reproduced in the PDF. If the PDF has less columns than the web, then all "additional" web columns will inserted to the bottom part of the last PDF column. $gadget.getValidationMessage("10200") (since 6.0.1) Returns a non-null string if the gadget cannot be rendered, because some technical (ex: resource not found) or configuration condition (ex: active sprint not found) is not met. If so, then the next 3 methods that produce content must not be called. $gadget.getImageUrl("10200", 600, 400) (removed in 6.0.1) Returns the (chart) image of the gadget with the ID = 10200 in 600x400 resolution. Don't use this for gadgets that don't generate any image, like Filter Results, for instance. This method was removed in 6.0.1, and now the image is returned as part of the HTML content (see next method). $gadget.getContentHtml("10200") Returns the HTML content of the gadget with the ID = 10200. This contains the chart image (if there is), the issue list, two-dimensional analytics, summary line (for charts), etc., depending on the type of gadget. $gadget.getDataTableHtml("10200") (since 6.0.1) Returns the HTML data table of the gadget with the ID = 10200. Important: please note that although all identifiers are numerical, they are actually string type objects! $gadget.getDashboardInfo(10100)   ## BANG! will NOT work! Exporting a single dashboard: find the dashboard ID, get the gadget IDs in that dashboard, iterate over the gadgets and export the current one. Exporting multiple dashboards: find all dashboard IDs, iterate over them, get the gadget IDs in the current dashboard (either sorted or unsorted), iterate over the gadgets and export the current one. Exporting a single gadget: find the gadget ID and export the gadget. Exporting multiple gadgets: find all gadget IDs, iterate over the gadgets and export the current one. You will be able to create any sort of custom dashboard export based on this guidance. For instance: under your company logo you can display gadgets in a 2-column layout with both the chart image and the related data table. Please study the default dashboard-fo.vm template for a full, working example and make sure you read the template development guide. When you view a dashboard in your browser, the URL in your browser's address bar typically ends like this: /secure/Dashboard.jspa?selectPageId=10310. The number 10310 is the ID of that specific dashboard you are looking at. When you look at the system default dashboard, the ?selectPageId=10310 part may be missing from the end of the URL. No problem, just use the Export Dashboard Details (PDF) view as explained in the next section. It will show you both the dashboard ID and all gadget IDs in that dashboard. If you are curious about the ID of some gadget, enable the view called Export Dashboard Details (PDF). This "for developers" type view is created automatically in disabled state, because it is only needed for inspecting the gadget IDs, not for "real" exports. This view renders the dashboard-details-fo.vm template, which exports a PDF document that displays the dashboard details (including its ID) the gadget details (IDs and other metadata) in the current dashboard. Think of this as a simple visual helper and debugger tool.